The 20th International Exhibition for Metalworking Technologies, which will take place from 20 to 24 February in Düsseldorf, shows the entire value added chain in an overall organic view. 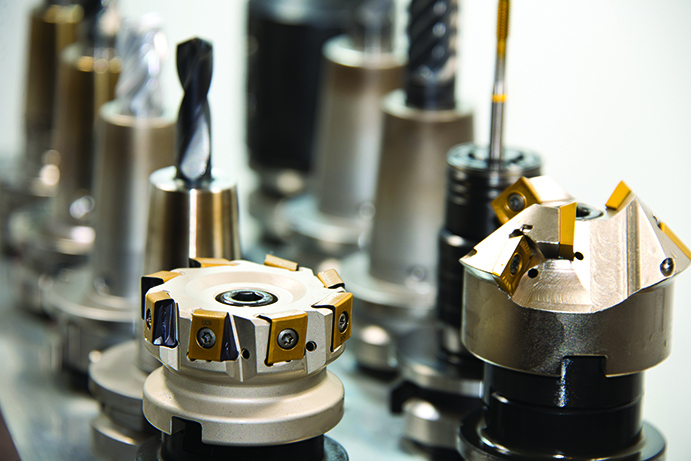 The classical topics of metalworking are found at the core of the METAV, such as machine tools, production systems, high-precision tools, automated material flows, computer technology, industrial electronics, and accessories. Classical metalworking and innovation are of course not a contradiction at the METAV. The latest technologies in traditional production technology can be seen at the fair, as can current solutions for Industry 4.0. With the core area, the METAV addresses numerous user industries including the automotive industry and its component suppliers, machine manufacturing, medical technology and aircraft construction, electrical engineering and electronics as well as the ironworking, sheet metal cutting and metalworking industries. This heart of the fair is intrinsically connected with the so-called Areas, which were successfully introduced with the new METAV concept in 2016. The fair thus represents the reality of modern industrial manufacturing compressed into its grounds.bTwo areas are dedicated to special topics of production technology, and two others are focused on special industrial sectors. The Quality Area shows how inseparably measurement technology is connected to industrial manufacturing. In the era of digital transformation, these categories are gaining steadily in perceived importance. Not least the measuring and testing technologies involved will become a supporting pillar for smart and big data concepts. The Additive Manufacturing Area, in contrast, illustrates that the corresponding manufacturing processes have firmly established their place in the factories.bThey are an outstanding complement to classical metalworking that joins in with the entire bandwidth of the process chain – even though mechanical post-processing is required in any case. This is made clear not least by the numerous exhibitors that rely on hybrid machines, i.e. production technology that combines additive with machining manufacturing. In the Moulding Area, it’s all about tool, mould and model building. Moulding is considered to be one of the most demanding fields of application in metalworking. The standards of precision and quality involved are extremely high, which encourages innovation in this area. Besides conventional processes, new process technologies are always finding their way in, such as laser-based manufacturing for fine texturing of design surfaces. Therefore, the requirements that apply and how they can be solved with innovative production technology are central topics of the Moulding Area. As the second user-based Area, the Medical Area focusses on medical technology. With its stringent requirements and massive innovation potential, it is a driver of technological progress in production technology. There is a good reason why medical technology ranks highly in the worldwide registration of patents. On the other hand, it is a segment with outstanding, long-term market perspectives. Demographic development of the world population is fuelling the demand, above all including the increasing average age in industrialised countries and the rising standard of living in numerous emerging countries. The METAV 2018 positions itself as a showplace for production solutions in Düsseldorf in the heart of North Rhine-Westphalia, one of the most concentrated, industrial economic regions in Europe. Mechanical engineering is traditionally very strong here. The industry employs more than 200,000 people in North Rhine-Westphalia making it the biggest industrial employer in the country. Almost a fifth of German revenue in mechanical engineering is earned in North Rhine-Westphalia. However, the METAV is not only an attractive and convenient meeting-place for manufacturers and users of the region, but also for the neighbouring Benelux countries and comparably nearby Scandinavian countries. The visitor quality here is high. In 2016, 63 per cent indicated that they have an influence on purchasing decisions. Industry lives from innovation more than ever today. The digital transformation has accelerated innovation cycles in a way that hardly anyone could have imagined just one generation ago. The visionary model in companies is therefore rapidly becoming obsolete. Anyone wanting to join the technological elite today is reliant on unleashing the innovation potential of the entire workforce. Employees must act and think technologically at the state of the art. Anyone who considers innovation to be exclusively the task of the executive floor could soon be caught up by the reality of the markets. So, it is important to anchor competence and a feeling for technological trends on the factory floors. The METAV can also score points here. Almost 40 per cent of visitors come from manufacturing, production or quality control. Hence, exhibitors also have an opportunity to directly address the practitioners in the companies – and there is no question that their perception and experience have a noticeable effect on purchasing in numerous companies. The METAV covers a broad range of specialisms dealing with numerous aspects of production technology. Its soul remains the entire bandwidth of metalworking, an area that has once again gained considerable innovative potential with the digital transformation. At the same time, the METAV showcases the connections to the numerous, flanking industrial topics that decisively codetermine production technology. And it does so at a time in which Industry 4.0 is causing us to conceive value creation in a more extensive, universal and more effectively networked form. As a showplace for innovations, the METAV 2018 doesn’t limit itself to the exhibitors, but rather it offers a comprehensive information programme dealing with all areas of production technology. VDW Technology Day “Safety guidelines at machine tools”. The METAV 2018 – the 20th International Exhibition for Metalworking Technologies – will be held in Düsseldorf from 20 to 24 February. It will be showcasing the entire spectrum of production technology. The principal focuses are machine tools, production systems, high-precision tools, automated material flows, computer technology, industrial electronics, and accessories, complemented by the new themes of Moulding, Medical, Additive Manufacturing and Quality, which are now permanently anchored in what are called “areas” with their own nomenclature in the METAV’s exhibition programme. The METAV’s target group for visitors includes all branches of industry that work metal, particularly machinery and plant manufacturers, the automotive industry and its component suppliers, aerospace, the electrical engineering industry, energy and medical technologies, tool and mould-making, plus metalworking and the craft sector.